The Kang of the South covers the upcoming issue of The Source magazine. Although T.I. has been around for many years, he has never yet had a solo cover of The Source magazine. Now that's changed, with Tip landing his very first cover of the hip-hop mag for their upcoming issue. Check out two brief excerpts from The Source's interview with the Kang below, where he talks on career's ups and downs, and his upcoming role in the movie "Identity Thief." The magazine hits newsstands on February 5th. 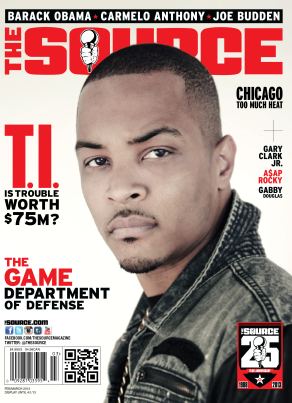 News cover the source T.I.